Bantam 6 Pack of compact radios 16 channel UHF 4 watts two way business radios by Blackbox have free shipping. 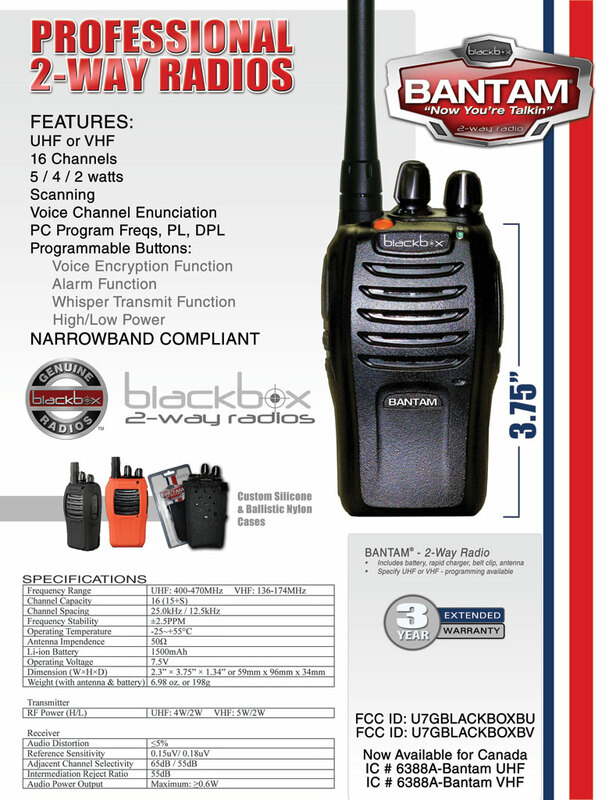 Blackbox Bantam series radio is a high quality rugged item in a small package. The Bantam is a compact full powered 16 channel radio. This rugged UHF radio is has an Alarm Button on top will send a signal to a partner on the same channel so the partner receives an alarm tone indicating an emergency. High/Low Power Switching is accomplished through a programmable button. Setting to low power saves on battery operating time. The Bantam has a Whisper Mode which allows you to be heard clearly even when you speak into the radio with a very low voice. The new Blackbox BANTAM is compatible with all Kenwood K1 style OR Motorola M1 style headset connector ports. Check out the “Voice Annunciation", this feature allows you to hear what channel you are on, a valuable feature when selecting a particular channel in the dark. Also informing you on low battery and scan on indications.